To download or view the issue for FREE, be sure to click HERE! Subscribe to receive a paper copy delivered right to your door, HERE! As this issue kicks off our 13th birthday, we have our annual “sweet treat” hunt in the issue! We will choose one randomly selected winner to receive a “sweet treat” box of scrapbooking goodies from some of our amazing partners! Happy hunting!!! Be sure to join us right here next week as we kick off our birthday celebration from March 25-29! Wait until you see the inspiring birthday themed projects our design team has created along with some amazing prizes each day from our partners! Thank you for joining us today and for celebrating the release of this issue with us and the kick off to our 13th birthday celebration. We would love to hear what your favourite part about SCT magazine is in the comments below! We will randomly select one reader to receive a copy of this issue! All are welcome to comment. Good luck! On a more personal note, I want to take a moment to thank YOU, our amazing readers, for all your love and support over 13 years. We would not be where we are as the most read papercraft publication in the world without you. A very special thank you to the amazing group of people who have and continue to work so hard on each issue, each event, each class and each kit. I am grateful to you as we celebrate this milestone together. To our industry partners who support every single thing we do, thank you! yay! Release day for the Spring issue really is a happy day! And to find hidden icons? What fun! Happy 13th Birthday! My favorite part about the magazine is the inspiration to create something beautiful. Here’s to another 13 years of beautiful designs! My favorite thing about your magazine is that looking through it always jump starts my creative process. There are so many things I love about your magazine. The quality of the magazine itself as far as size, thickness of pages and bright beautiful colors. It’s always an inspiration and gets the creative juices flowing. Love to get first glimpse at all the new product out there. It provides great ideas for all of my paper crafting needs. Keep up the good work! 13! I love the multiple ways you show to do a single layout and the product features. My favorite part of the issues is the layouts, they have great instructions and are always inspirational! Congrats on 13th! My favorite part is seeing 2-page layouts with a generous number of photos. I like to see how people fit all the photos and yet still make a fancy page which fits the tone/theme of the photos. I can’t get enough 2-page layout ideas! Thanks for the opportunity to win. Your magazine is beautiful. The photographs, designs, and layout make it a joy to read, and a very inspiring tool to jump start my creativity. Thank you for continuing to produce a quality magazine. And, Happy Birthday! Happy 13th Anniversary! I love the beautiful projects, tips and easy instruction. Always packed with inspiration. Thanks for making this great magazine–I had been a Papercrafts subscriber for many years and truly missed it, until I found your magazine. 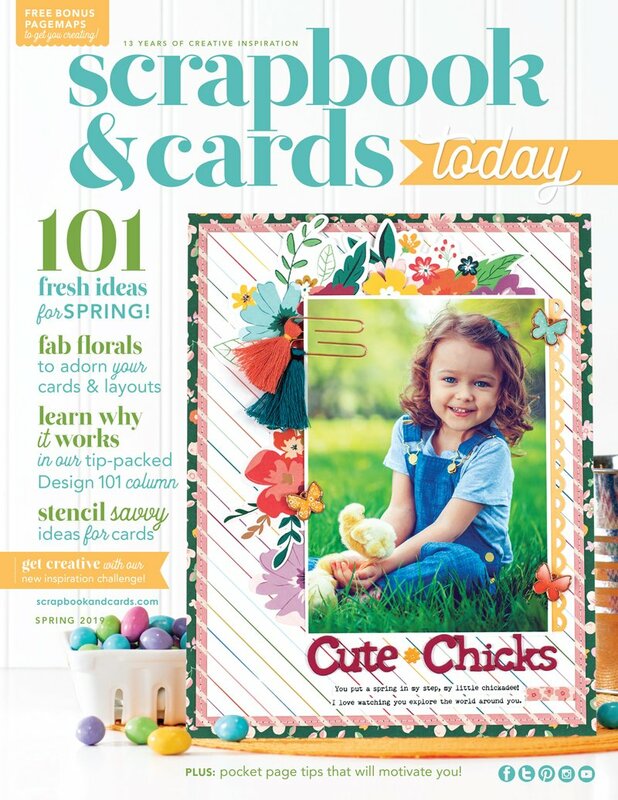 I love the column about the latest and greatest new products, and as a cardmaker, all the great card designs and layout ideas. Congrats on 13 years–you’re now a “Teen” in the world of magazines! Certainly would be nice to win a hard copy of the magazine, Congratulations on 13 years! Your magazine is a never ending source of inspiration and ideas! I love the essentials column which keeps me up to date on the latest and greatest! The designer challenge is also one place I head to! Keep up the excellent work! Happy Birthday SCT! May you have many more yers of success in the crafting industry. Thanks for all the inspiration you provide. so much inspiration from the pages. I love the top 10 new products- I know what to start saving up to buy. Thanks for a wonderful 13 years! My favourite thing is INSPIRATION. I live in a city with no local scrapbook store so I love to see what others are doing. Beautiful, inspiring, full of sunshine and love the creativity! Another amazing release SCT, thank you!!! I’m looking forward to getting my hands on a copy. Happy Birthday! Congrats on 13 years! This issue is beautiful. I can’t say there’s one favourite thing about it that I love because I love all of it! But if I had to pick, I’d say the 3i’s, followed closely by the Page Maps and Product Play columns. Yay! I have been excited for the Spring Release. Was thrilled to receive a copy included in my SCT spring kit! I love all components included in the SCT magazine so it is difficult to pick just one part that is a favorite. Layouts, inspiration galore, how to’s, page maps…and the list continues:) Thank you SCT for your hard work in producing this awesome magazine for us!! Congratulations on 13 years! When I first discovered SCT, I was searching the web for cardmaking ideas and was delighted to find you, and find you were Canadian too🇨🇦.I think that must have been about six or seven years ago. I still love searching the magazine for ideas . Of course, I also love seeing all the new products too! I love both the page and card sketches, especially the double page layouts. Happy Birthday! It’s impossible to pick a favorite thing…I even love looking at the adverts! I love the 2-page layout ideas and as I get the seasonal kits, I often have the paper to make them. But truthfully, I love the whole magazine and read each one cover to cover. Keep up the great work. Love the beautiful colours, inspirational ideas and techniques found in the spring issue. Also enjoy seeing the new products available. Happy 13th Birthday!!! What I love the most about SCT magazine is the great inspiration to make lot of wonderful projects!!! Love, love, love the 10 Most Wanted!!!! I like the section on pocket scrapbooking most because I have just started to expand my horizon with this interesting – and time-saving! – technique. Happy Birthday, a million thanks to SCT and to the generosity of American Crafts. My favorite was all the layout ideas and the tips on pocket scrapping. My favorite was the section on the mini album. I also enjoyed Design 101. Thank you for all the giveaways and inspiration. Happy 13th Birthday SCT! Beautiful and inspiring spring designs! Love Paige’s layout and cut file.